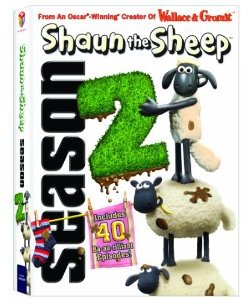 Shaun the Sheep Season 2 Gift Set includes 40 episodes of fun! Shaun the Sheep is a favorite around here. All of us (including my husband) can always count on Shaun and his friends for a good laugh. The complete second season of Shaun the Sheep has arrived with 40 hilarious episodes of woolly shenanigans! The Oscar®-winning creators of “Wallace and Gromit™” strike again with the mischievous barnyard antics of Shaun, Bitzer, Shirley, Timmy, and those naughty Pigs next door. From fancy wheels and outrageous deals to foxy crimes and Christmas time, there’s something for everyone in this fun- filled collectible gift set of must-have treats the whole family will love! I was provided this dvd for free for review purposes. No other compensation was received. All opinions are my own.